It begins with absence and desire. It begins with a discovery of witches. Oh the awesomeness of this book/series! This is the third time I’m reading it, in preparation for the release of the final book, The Book of Life, this July. I bought the e-book while I was waiting on line at an audition (story of my life) and once I started, I could not stop. 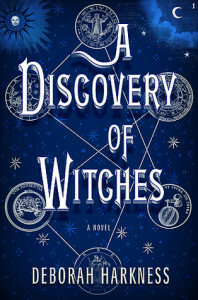 The story starts off with historian and witch Diana Bishop (yes, of those Bishops from Salem, Mass.) who comes across a manuscript in the Bodleian Library at Oxford. After calling the book up and back to the stacks, fantastical creatures (daemons, witches, vampires) start flocking to Oxford, all wanting something from the book and Diana. One of whom is a certain Vampire named Matthew de Clairmont. Matthew and Diana are faced with difficult decisions as to what their love and the manuscript mean not only for their future, but that of all the fantastical creatures in their world. But just so you know, you’re going to want to buy the next book in the series, Shadow of Night, the second you finish this one. Believe me, it’s even better and that’s saying something.